Of course having such fond memories of May Day I was anxious for my children to enjoy it as well. After a few years of not being able to make it a tradition among their friends we finally gave up. Once again we had to make our own tradition. We started when we lived in Montclair, Virginia. 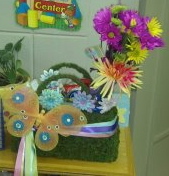 On May 1st we would go to Annapolis, Maryland for the annual Garden Club May Basket Competition. Every business would participate and many of the homes joined the annual tradition. The baskets were unbelievable! My favorite was a birdbath in a churchyard that was transformed into a basket. If I ever visit Annapolis again it will definately be on May 1st! After we moved to Alabama we delivered May Baskets to our elderly neighbor and one year, she left baskets at our door. Melanie and Levi were thrilled. And I thought, finally! Growing up during the Cold War, I am surprised we were allowed to celebrate May Day with its communist background. We saw it as a Celebration of Spring, not a day for political protest. Also known as International Workers Day, May 1st is an national holiday in many countries. In an effort to minimize its communist association, the day has also been home to a feast day of St. Joseph the Worker (designated byPope Pius XII in 1955) and in 1958 both Law Day and Loyalty Day (designated by President Eisenhower). Whatever its beginnings, the children of Manhattan, Kansas saw May Day as the Celebration of Spring and Friendship. This year, I got a May Basket. One of my students read my reminissing about May Day on our classroom website. It totally made my day. I was so thrilled with the sweetness of the gesture that I quickly took a picture and posted it on Facebook where I tagged all of my childhood friends. That in turn brought comments of our days in the neighborhood and our May Baskets. One act of kindness brought memories and happy thoughts to many! This entry was posted in Notes from the teacher's desk and tagged Alabama, Annapolis Maryland, Cold War, Dwight D. Eisenhower, International Workers Day, Law Day, Law Day U.S.A., Loyalty Day, Manhattan Kansas, May Baskets, May Day, Notes from the teacher's desk, President Eisenhower, St. Joseph, the worker, Virginia. Bookmark the permalink.